Gov. Mike Dunleavy’s plan to cut upwards of $225 million from the state’s Medicaid budget would drastically reshape the overall health care system in Alaska, according to the leader of the state hospital and nursing home association. 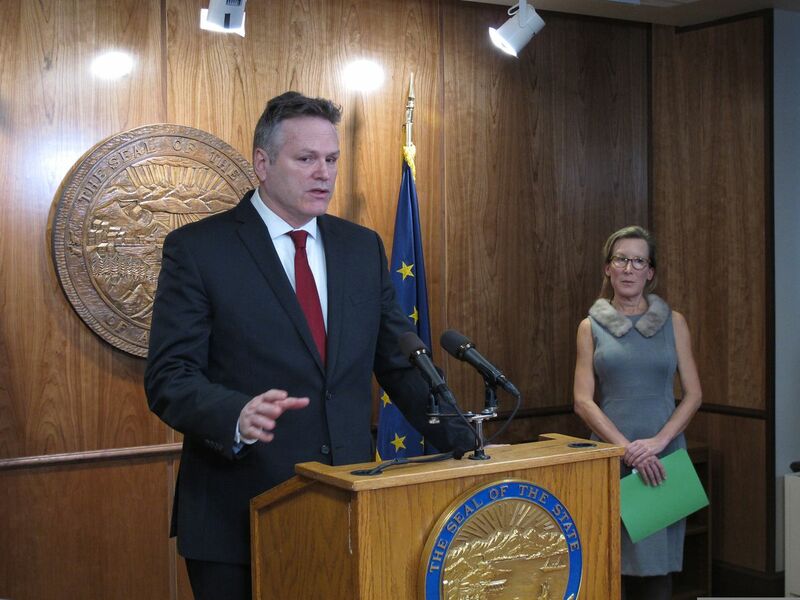 In his fiscal year 2020 budget released Wednesday morning, Dunleavy is proposing to reduce the state’s portion of Medicaid funding, which is expected to be $677 million in the current 2019 fiscal year, by more than 33 percent. Dunleavy has pledged to eliminate the state’s $1.6 billion budget deficit without new taxes while restoring Permanent Fund dividend payments to their statutory calculation. The PFD payment for the upcoming budget year is expected to be about $3,000 per Alaskan for a total appropriation of roughly $1.9 billion. “This budget is going to impact all Alaskans; it’s too big not to,” Dunleavy said during a news conference to announce his budget plan. Dunleavy has repeatedly said he wants to reduce state spending on Medicaid to a sustainable level. As of October, 210,276 Alaskans were enrolled in Medicaid or the Children’s Health Insurance Program, also known as CHIP, according to the Centers for Medicare and Medicaid Services. Office of Management and Budget policy director Mike Barnhill said in a press briefing following the release of the budget that most of the Medicaid cuts would come through reducing provider reimbursement rates. Barnhill emphasized that the administration is not proposing to eliminate coverage for anyone currently enrolled in the state’s Medicaid program. Instead, it’s working with the federal Centers for Medicaid and Medicare Services on new ways of providing Medicaid coverage at a reduced cost to the state. “Alaska reimburses providers under the Medicaid program at a higher rate than any other state in the country so we’re taking a close look at that and then we’re looking at different ways of treating and providing access to the expansion (Medicaid) population for medical care,” Barnhill said. However, state Medicaid funds are tied to large sums of federal money. The federal government covers at least 50 percent of the costs generated by each Medicaid enrollee. Costs from traditional Medicaid recipients are covered 50-50 by the state and the federal government, while Medicaid expansion recipients are covered 93 percent by the federal government and 7 percent by the state this year. The Medicaid expansion cost share will shift to 90 percent federal and 10 percent state for 2020 and beyond. Alaska Native Medicaid claims are paid 100 percent by the federal Indian Health Service for care provided at a tribal health facility. According to the Legislative Finance Division, overall spending on Medicaid in Alaska has increased from $1.7 billion to more than $2.3 billion since fiscal year 2015, but the state’s portion of that has actually gone down from $724 million in 2015 to $677 million, which includes a $15 million supplemental budget request, in the current fiscal year. Those state savings have largely been attributed to shifting state costs to the federal government through Medicaid expansion and the Medicaid reform package the Legislature passed in 2016 with broad bipartisan support. Arduin said it’s unclear at this point exactly how much federal money the state would forgo with a roughly $225 million cut to the Medicaid program because the underlying details of the state’s plan are still being worked out. The overall DHSS budget would be cut by $364 million, or 30 percent, from current levels, according to budget documents. Alaska State Hospital and Nursing Home Association CEO Becky Hultberg said in an interview that people reviewing the governor’s proposal in her office would expect a total of at least $700 million in overall cuts to Medicaid based on a $225 million state cut. Hultberg was a former commissioner of the Department of Administration under former Gov. Sean Parnell. Pulling that much money out of Alaska’s health care system would “fundamentally restructure” it, she stressed. While the proposed cuts may improve the state’s bottom line, they would be extremely damaging to hospitals, particularly rural hospitals, if they are implemented through provider reimbursement rate reductions, according to Hultberg. “We had several small hospitals with less than 10 days’ cash on hand last year. They cannot sustain significant provider cuts without closing their doors,” she said. Alaska health care providers are reimbursed by Medicaid at some of the highest rates in the country because the state’s reimbursement rates are set to cover the cost of the service provided while other states pay less than the cost to cover individual services, Hultberg said. A study released Monday and commissioned by the Hospital and Nursing Home Association concluded that pulling roughly $420 million in Medicaid funding out of Alaska’s health care industry would result in nearly 3,700 jobs lost statewide; about 1,800 of those would come out of hospitals, private practice offices and other health care providers. That study looked specifically at Medicaid expansion funding, which many political observers thought Dunleavy would attempt to repeal. The state reduced Medicaid payment rates for professional services and hospitals by 5 percent to 8 percent in 2017. Further drastic reductions to provider payment rates would also result in fewer physicians and health care facilities accepting Medicaid patients, Hultberg added. “I think there’s either a lack of understanding of reality (by the Dunleavy administration) or a willingness just to make Alaska a poorer and less safe place,” Hultberg said. Alaska Primary Care Association Policy Director Jon Zasada said his organization is focused on the apparent consolidation — based on budget documents — of behavioral health, senior and disability services into the general Medicaid Services classification. APCA officials want to know if it is simply a budget reporting technique or an attempt to change or repeal the services. A spokesman for DHSS referred a request to interview Crum on potential Medicaid policy changes to a phone line in OMB dedicated to press inquiries about the budget. The phone line was unattended. Zasada noted that Medicaid reimbursement rates for the federally qualified health care centers the APCA represents are calculated differently than rates for hospitals or private practice physicians; however, those rates have been frozen for four years, he added. APCA officials are also concerned about a prospective $27 million cut to optional adult dental care coverage detailed in a supplemental budget document provided by the administration. Zasada said eliminating coverage for a preventative care program often just leads to more costly emergency care, which would then be covered by emergency service Medicaid funding. Critics of Alaska’s Medicaid program have often highlighted the fact that the state provides coverage for more optional services than nearly every other state as well.